New particles produced in the LHC's high-energy proton-proton collisions don't hang around for long. A Higgs boson exists for less than a thousandth of a billionth of a billionth of a second before decaying into lighter particles, which can then be tracked or stopped in our detectors. Nothing rules out the existence of much longer-lived particles though, and certain theoretical scenarios predict that such extraordinary objects could get trapped in the LHC detectors, sitting there quietly for days. The CMS collaboration has reported new results in its search for heavy long-lived particles (LLPs), which could lose their kinetic energy and come to a standstill in the LHC detectors. Provided that the particles live for longer than a few tens of nanoseconds, their decay would be visible during periods when no LHC collisions are taking place, producing a stream of ordinary matter seemingly out of nowhere. The CMS team looked for these types of non-collision events in the densest detector materials of the experiment, where the long-lived particles are most likely to be stopped, based on LHC collisions in 2015 and 2016. Despite scouring data from a period of more than 700 hours, nothing strange was spotted. The results set the tightest cross-section and mass limits for hadronically-decaying long-lived particles that stop in the detector to date, and the first limits on stopped long-lived particles produced in proton-proton collisions at an energy of 13 TeV. 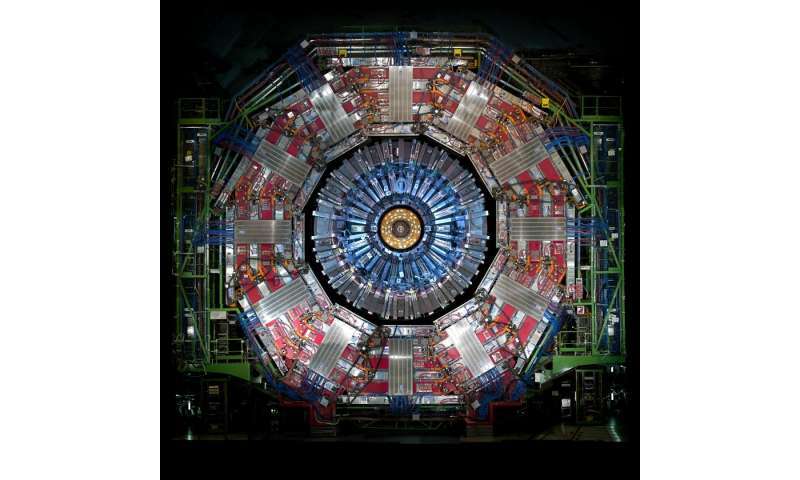 The Standard Model, the theoretical framework that describes all the elementary particles, was vindicated in 2012 with the discovery of the Higgs boson. But some of the universe's biggest mysteries remain unexplained, such as why matter prevailed over antimatter in the early universe or what exactly dark matter is. Long-lived particles are among numerous exotic species that would help address these mysteries and their discovery would constitute a clear sign of physics beyond the Standard Model. In particular, the decays searched for in CMS concerned long-lived gluinos arising in a model called "split" supersymmetry (SUSY) and exotic particles called "MCHAMPs". While the search for long-lived particles at the LHC is making rapid progress at both CMS and ATLAS, the construction of a dedicated LLP detector has been proposed for the high-luminosity era of the LHC. MATHUSLA (Massive Timing Hodoscope for Ultra Stable Neutral Particles) is planned to be a surface detector placed 100 metres above either ATLAS or CMS. It would be an enormous (200 × 200 × 20 m) box, mostly empty except for the very sensitive equipment used to detect LLPs produced in LHC collisions. Since LLPs interact weakly with ordinary matter, they will experience no trouble travelling through the rocks between the underground experiment and MATHUSLA. This process is similar to how weakly interacting cosmic rays travel through the atmosphere and pass through the Earth to reach our underground detectors, only in reverse. If constructed, the experiment will explore many more scenarios and bring us closer to discovering new physics. More money, more money! Lifetime tenure! !